This past weekend was the opening of the group exhibition "Surf&Street-Art" celebrating the Hurley Australian Open of Surfing at the Painters Gallery (44 Market Ln, Manly). My latest surf/ocean inspired artwork is there, alongside other great work by local artists such as Lee McConnell and Dino Halcrow, plus photography, sculpture and more. It will be up until the 21st of February, all artwork for sale. 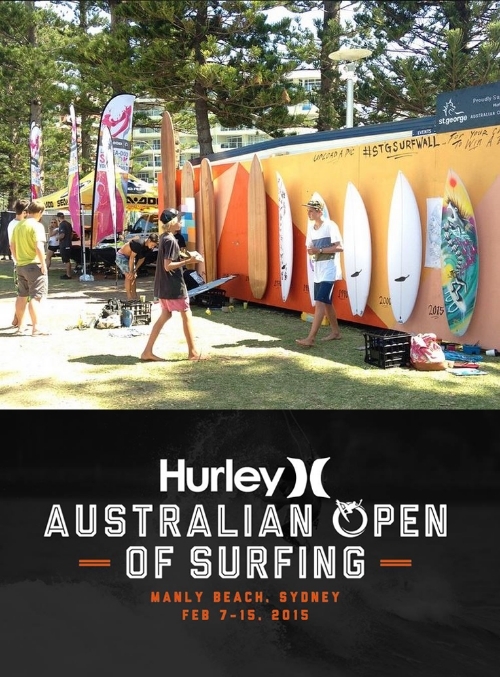 At the same time, I was invited to do live-painting at the Hurley Australian Open of Surfing at the St George Bank Surf-wall alongside other contemporary artists legends. I will be back there this Saturday to do some finishing touches to my surfboard.